The pagoda is located 9 km along the Ang Thong-Pho Thong route and 2 km along an access road. 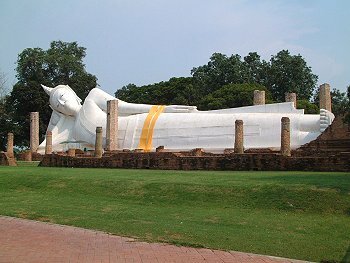 There is a large reclining Buddha image 50m long, lying in the open area. The pagoda was left abandoned for more than 100 years until King Borrommakot of Ayutthaya ordered the reconstruction. Records show that King Rama IV visited this temple twice. Wat Khun Inthra Pramun is regarded as the most important temple in Ang Thong Province.